131:0.1 DURING THE ALEXANDRIAN sojourn of Jesus, Gonod, and Ganid, the young man spent much of his time and no small sum of his father’s money making a collection of the teachings of the world’s religions about God and his relations with mortal man. Ganid employed more than threescore learned translators in the making of this abstract of the religious doctrines of the world concerning the Deities. And it should be made plain in this record that all these teachings portraying monotheism were largely derived, directly or indirectly, from the preachments of the missionaries of Machiventa Melchizedek, who went forth from their Salem headquarters to spread the doctrine of one God—the Most High—to the ends of the earth. 131:1.3 “Even if the earth should pass away, the resplendent face of the Supreme would abide in majesty and glory. The Most High is the first and the last, the beginning and the end of everything. There is but this one God, and his name is Truth. God is self-existent, and he is devoid of all anger and enmity; he is immortal and infinite. Our God is omnipotent and bounteous. While he has many manifestations, we worship only God himself. God knows all—our secrets and our proclamations; he also knows what each of us deserves. His might is equal to all things. 131:1.8 “At all times call upon his name, and as you believe in his name, so shall your prayer be heard. What a great honor it is to worship the Most High! All the worlds and the universes worship the Most High. And with all your prayers give thanks—ascend to worship. Prayerful worship shuns evil and forbids sin. At all times let us praise the name of the Most High. The man who takes shelter in the Most High conceals his defects from the universe. When you stand before God with a clean heart, you become fearless of all creation. The Most High is like a loving father and mother; he really loves us, his children on earth. Our God will forgive us and guide our footsteps into the ways of salvation. He will take us by the hand and lead us to himself. God saves those who trust him; he does not compel man to serve his name. 131:2.7 “God is our Father; the Lord is our redeemer. God has created the universal hosts, and he preserves them all. His righteousness is like the mountains and his judgment like the great deep. He causes us to drink of the river of his pleasures, and in his light we shall see light. It is good to give thanks to the Lord and to sing praises to the Most High; to show forth loving- kindness in the morning and the divine faithfulness every night. God’s kingdom is an everlasting kingdom, and his dominion endures throughout all generations. The Lord is my shepherd; I shall not want. He makes me to lie down in green pastures; he leads me beside still waters. He restores my soul. He leads me in the paths of righteousness. Yes, even though I walk through the valley of the shadow of death, I will fear no evil, for God is with me. Surely goodness and mercy shall follow me all the days of my life, and I shall dwell in the house of the Lord forever. 131:2.8 “ Yahweh is the God of my salvation; therefore in the divine name will I put my trust. I will trust in the Lord with all my heart; I will lean not upon my own understanding. In all my ways I will acknowledge him, and he shall direct my paths. The Lord is faithful; he keeps his word with those who serve him; the just shall live by his faith. If you do not well, it is because sin lies at the door; men reap the evil they plough and the sin they sow. Fret not yourself because of evildoers. If you regard iniquity in your heart, the Lord will not hear you; if you sin against God, you also wrong your own soul. God will bring every man’s work to judgment with every secret thing, whether it be good or evil. As a man thinks in his heart, so is he. 131:2.10 “‘Come now, let us reason together,’ says the Lord, ‘Though your sins be as scarlet, they shall be as white as snow. Though they be red like crimson, they shall be as wool.’ But there is no peace for the wicked; it is your own sins which have withheld the good things from you. God is the health of my countenance and the joy of my soul. The eternal God is my strength; he is our dwelling place, and underneath are the everlasting arms. The Lord is near to those who are brokenhearted; he saves all who have a childlike spirit. Many are the afflictions of the righteous man, but the Lord delivers him out of them all. Commit your way to the Lord—trust him—and he will bring it to pass. He who dwells in the secret place of the Most High shall abide under the shadow of the Almighty. 131:2.13 “And to all who love the Lord supremely and their neighbors like themselves, the God of heaven says: ‘I will ransom you from the grave; I will redeem you from death. I will be merciful to your children, as well as just. Have I not said of my creatures on earth, you are the sons of the living God? And have I not loved you with an everlasting love? Have I not called you to become like me and to dwell forever with me in Paradise?'" 131:3.5 “No religionist may hope to attain the enlightenment of immortal wisdom who persists in being slothful, indolent, feeble, idle, shameless, and selfish. But whoso is thoughtful, prudent, reflective, fervent, and earnest—even while he yet lives on earth—may attain the supreme enlightenment of the peace and liberty of divine wisdom. Remember, every act shall receive its reward. Evil results in sorrow and sin ends in pain. Joy and happiness are the outcome of a good life. Even the evildoer enjoys a season of grace before the time of the full ripening of his evil deeds, but inevitably there must come the full harvest of evil-doing. Let no man think lightly of sin, saying in his heart: ‘The penalty of wrongdoing shall not come near me.’ What you do shall be done to you, in the judgment of wisdom. Injustice done to your fellows shall come back upon you. The creature cannot escape the destiny of his deeds. 131:3.6 “The fool has said in his heart, ‘Evil shall not overtake me'; but safety is found only when the soul craves reproof and the mind seeks wisdom. The wise man is a noble soul who is friendly in the midst of his enemies, tranquil among the turbulent, and generous among the grasping. Love of self is like weeds in a goodly field. Selfishness leads to grief; perpetual care kills. The tamed mind yields happiness. He is the greatest of warriors who overcomes and subdues himself. Restraint in all things is good. He alone is a superior person who esteems virtue and is observant of his duty. Let not anger and hate master you. Speak harshly of no one. Contentment is the greatest wealth. What is given wisely is well saved. Do not to others those things you would not wish done to you. Pay good for evil; overcome evil with the good. 131:4.2 “He is the great God, in every way supreme. He is the Lord who encompasses all things. He is the creator and controller of the universe of universes. God is one God; he is alone and by himself; he is the only one. And this one God is our Maker and the last destiny of the soul. The Supreme One is brilliant beyond description; he is the Light of Lights. Every heart and every world is illuminated by this divine light. God is our protector—he stands by the side of his creatures—and those who learn to know him become immortal. God is the great source of energy; he is the Great Soul. He exercises universal lordship over all. This one God is loving, glorious, and adorable. Our God is supreme in power and abides in the supreme abode. This true Person is eternal and divine; he is the primal Lord of heaven. All the prophets have hailed him, and he has revealed himself to us. We worship him. O Supreme Person, source of beings, Lord of creation, and ruler of the universe, reveal to us, your creatures, the power whereby you abide immanent! God has made the sun and the stars; he is bright, pure, and self-existent. His eternal knowledge is divinely wise. The Eternal is unpenetrated by evil. Inasmuch as the universe sprang from God, he does rule it appropriately. He is the cause of creation, and hence are all things established in him. 131:4.5 “We have learned to win faith by the yearning of our hearts. We have attained wisdom by the restraint of our senses, and by wisdom we have experienced peace in the Supreme. He who is full of faith worships truly when his inner self is intent upon God. Our God wears the heavens as a mantle; he also inhabits the other six wide-spreading universes. He is supreme over all and in all. We crave forgiveness from the Lord for all of our trespasses against our fellows; and we would release our friend from the wrong he has done us. Our spirit loathes all evil; therefore, O Lord, free us from all taint of sin. We pray to God as a comforter, protector, and savior—one who loves us. 131:4.6 “The spirit of the Universe Keeper enters the soul of the simple creature. That man is wise who worships the One God. Those who strive for perfection must indeed know the Lord Supreme. He never fears who knows the blissful security of the Supreme, for the Supreme says to those who serve him, ‘Fear not, for I am with you.’ The God of providence is our Father. God is truth. And it is the desire of God that his creatures should understand him—come fully to know the truth. Truth is eternal; it sustains the universe. Our supreme desire shall be union with the Supreme. The Great Controller is the generator of all things—all evolves from him. And this is the sum of duty: Let no man do to another what would be repugnant to himself; cherish no malice, smite not him who smites you, conquer anger with mercy, and vanquish hate by benevolence. And all this we should do because God is a kind friend and a gracious father who remits all our earthly offenses. 131:4.7 “God is our Father, the earth our mother, and the universe our birthplace. Without God the soul is a prisoner; to know God releases the soul. By meditation on God, by union with him, there comes deliverance from the illusions of evil and ultimate salvation from all material fetters. When man shall roll up space as a piece of leather, then will come the end of evil because man has found God. O God, save us from the threefold ruin of hell —lust, wrath, and avarice! O soul, gird yourself for the spirit struggle of immortality! When the end of mortal life comes, hesitate not to forsake this body for a more fit and beautiful form and to awake in the realms of the Supreme and Immortal, where there is no fear, sorrow, hunger, thirst, or death. To know God is to cut the cords of death. The God-knowing soul rises in the universe like the cream appears on top of the milk. We worship God, the all-worker, the Great Soul, who is ever seated in the heart of his creatures. And they who know that God is enthroned in the human heart are destined to become like him—immortal. Evil must be left behind in this world, but virtue follows the soul to heaven. 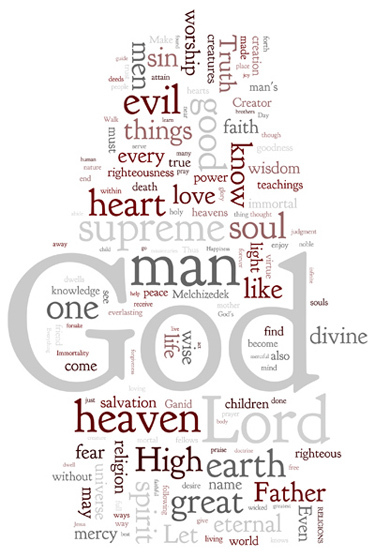 131:5.2 “All things come from, and belong to, the One God—all-wise, good, righteous, holy, resplendent, and glorious. This, our God, is the source of all luminosity. He is the Creator, the God of all good purposes, and the protector of the justice of the universe. The wise course in life is to act in consonance with the spirit of truth. God is all-seeing, and he beholds both the evil deeds of the wicked and the good works of the righteous; our God observes all things with a flashing eye. His touch is the touch of healing. The Lord is an all-powerful benefactor. God stretches out his beneficent hand to both the righteous and the wicked. God established the world and ordained the rewards for good and for evil. The all-wise God has promised immortality to the pious souls who think purely and act righteously. As you supremely desire, so shall you be. The light of the sun is as wisdom to those who discern God in the universe. 131:8.4 “The wise man universalizes his heart. A little knowledge is a dangerous thing. Those who aspire to greatness must learn to humble themselves. In creation the Supreme became the world’s mother. To know one’s mother is to recognize one’s sonship. He is a wise man who regards all parts from the point of view of the whole. Relate yourself to every man as if you were in his place. Recompense injury with kindness. If you love people, they will draw near you—you will have no difficulty in winning them.